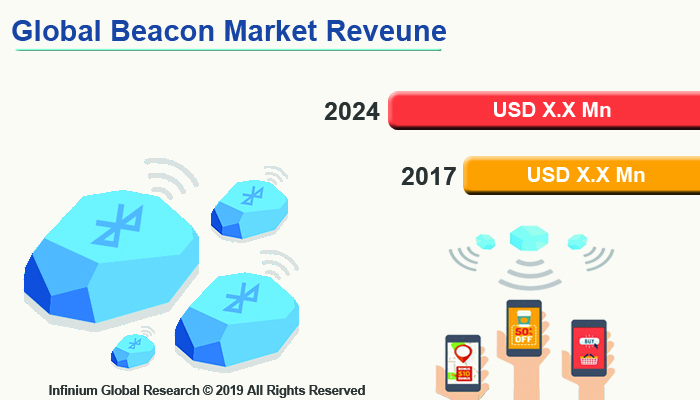 A recent report published by Infinium Global Research on beacon market provides in-depth analysis of segments and sub-segments in the global as well as regional beacon market. The study also highlights the impact of drivers, restraints, and macro indicators on the global and regional beacon market over the short term as well as long term. The report is a comprehensive presentation of trends, forecast and dollar values of global beacon market. According to the report, the global beacon market is projected to grow at a Robust CAGR over the forecast period of 2018-2024. Beacons are small and inexpensive devices that transmit radio frequency signals and notify nearby Bluetooth devices of their presence information. Beacon transmit a signal via Bluetooth Low Energy (BLE) or Bluetooth SMART technology up to 50 meters. It is typically powered by small batteries. Beacon helps navigators to their destination and no internet connection required as it communicates through Bluetooth and others are some benefits offered by the beacon. In addition, beacons technology is extensively adopted in retail, transportation, and logistics, travel, tourism & hospitality, healthcare sector. The growing application of beacon technology in the retail sector is driving the growth of beacon market. Moreover, beacon technology are helps in navigation, getting reviews, getting offers based on their previous track record purchases is anticipated to have a positive impact on the growth of the market globally. On the other hand, the increasing trends of offline stores to choose online platforms in the retail sector is also promotes the growth of the market. Benefits such as long life duration and increased cost-efficiency are visualized to create significant demand for the global beacon market. Addition to that, the rapid population coupled with Increasing penetration of smartphones is also the ample the growth of the market. Going further, increased in disposable income coupled with changing lifestyle and entry of foreign retailers ample the growth of the organized retail sector. Going further, improvement in the organized retail sector is expected to register significant growth opportunities for the beacon market in coming years. Moreover, Beacon improvement with Industry 4.0. a and Internet of Things (IoT) which help the global beacon market to gain more revenue with the advent of time. On the basis of region, North America is accounted to be a significant share in the global beacon market during the forecast period. Rapid growth in the e-commerce ecosystem and increasing penetration of smartphones in developing countries are some factors responsible for the growth of beacon market in the North America region. On the other hands, Asia Pacific is estimated to grow with healthy CAGR in the global beacon market during the forecast period. China is likely to add maximum share in the Asia Pacific region owing to rapidly adopting iBeacons in Shopping mall an enormous scale in order to utilize them for publicity. Moreover, rapid urbanization and modernization in developing countries such as China, India, and Japan are likely to fuel up the beacon market. Additionally, the growing use of smartphones by gigantic population is also escalating the demand of global beacon market in the Asia Pacific region. The report on global beacon market covers segments such as type, technology, and application. On the basis of type, the sub-markets include Eddystone, IBeacon, AltBeacon, and Others (Paypal, GeoBeacon). On the basis of technology, the sub-markets include ultrasound, Bluetooth, and Wi-fi. On the basis of application, the sub-markets include travel, tourism & hospitality, transportation and logistics, healthcare, and retail. The report provides profiles of the companies in the market such as Leantegra Inc., Beaconinside GmbH, Hewlett Packard Enterprise Company, Dell Technologies Inc., Apple, Inc., Onyx Beacon Ltd., Kontakt.io, Inc., Estimote, Inc., BlueCats Australia Pty Limited, and Accent Advanced Systems, SLU. The report provides deep insights into the demand forecasts, market trends, and micro and macro indicators. In addition, this report provides insights into the factors that are driving and restraining the growth in this market. Moreover, The IGR-Growth Matrix analysis given in the report brings an insight into the investment areas that existing or new market players can consider. The report provides insights into the market using analytical tools such as Porter's five forces analysis and DRO analysis of beacon market. Moreover, the study highlights current market trends and provides forecast from 2018-2024. We also have highlighted future trends in the market that will affect the demand during the forecast period. Moreover, the competitive analysis given in each regional market brings an insight into the market share of the leading players.